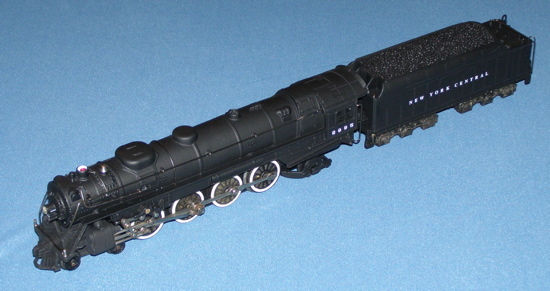 Here are two views of the New York Central 4-8-2 Mohawk L-2d I converted from a Gilbert Hudson. After finishing the Pennsylvania 2-10-2 I made from a Gilbert K-5 I wanted to see if I could duplicate the frame splicing technique using hand tools. I only used a hacksaw and files to modify two six-wheel frames so that they could be joined by the same tab and groove method I used on the 2-10-2. As it turned out it was another successful effort. I looked through my collection of Alvin Staufer train books and found some pictures of NYC Mohawks that closely resembled the Hudson in outward appearance. The L-2d nos. 2995 and 2998 were converted to joint passenger and freight service. The 2998 spent some time on display at the 1940 New York World's Fair. These engines were very close to the Hudson, so much so that you had to count the drivers to tell them apart. A picture of the front of the locomotive. I numbered the boiler front number board and headlights of all my conversions. I always liked the oval NYC logo Gilbert included on the Hudson boiler front but lamented the fact that it was not painted or lettered. So I created a very small NYC oval logo (you can actually read it) and put it on the boiler front casting. 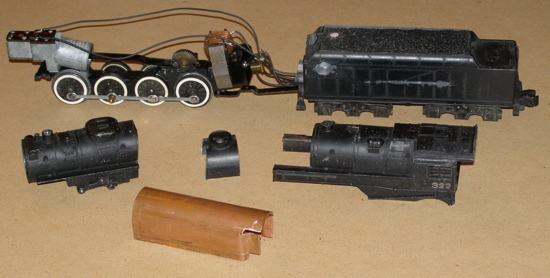 The component parts of the Mohawk: the finished frame with motor, smoke unit and drivers; the tender; and the pieces for the boiler. On this engine I didn't want to just cut it once and stretch the boiler because that would put too much space between the domes. To avoid this I cut the boiler in one place and then cut along the running boards and then cut vertically to remove steam dome. This way I could move the steam dome back a little so the extension was not all in one place. The copper pipe used to bridge the gap and strengthen the extended boiler is included in the picture. The pipe was cut lengthwise on one side and opened up to form an inverted "U" similar to the one I used in the 2-10-2 project. The boiler installed on the frame for a test fitting prior to using JB Weld to join the pieces together. The steam dome section is positioned approximately where it will be "welded" into position. 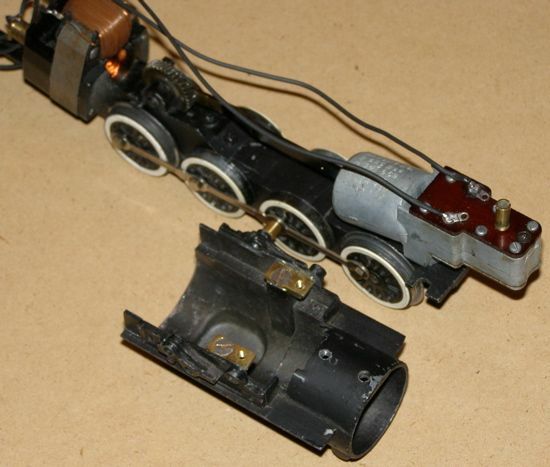 A view of the smoke unit and the underside of the front part of the boiler showing how the mounting points were shifted forward. The real Mohawks had the front drivers closer to the cylinders than the Hudsons did. This necessitated shifting the frame slightly forward under the boiler. Because of this the smoke unit also had to be modified so the smoke tube would line up with the smoke stack. I solved this problem by drilling a new hole for the smoke tube and tapping the fiber top plate (it takes a 10-32 tap). The original hole was sealed with JB Weld. This modification did not affect the smoking ability of the unit. 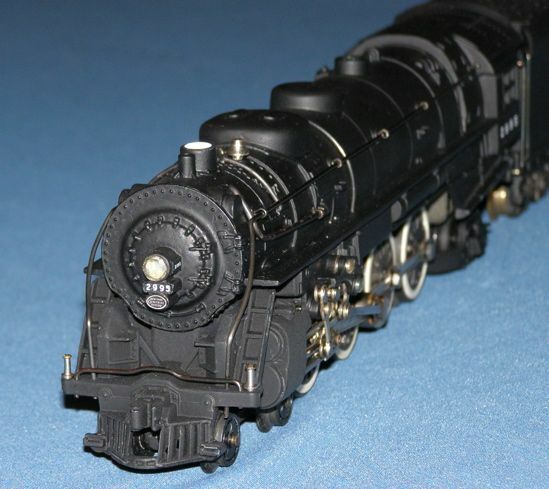 This locomotive ran for about four hours on the ACSG modular layout during the NMRA train meet in Virginia Beach in September 2009. It performed very well. 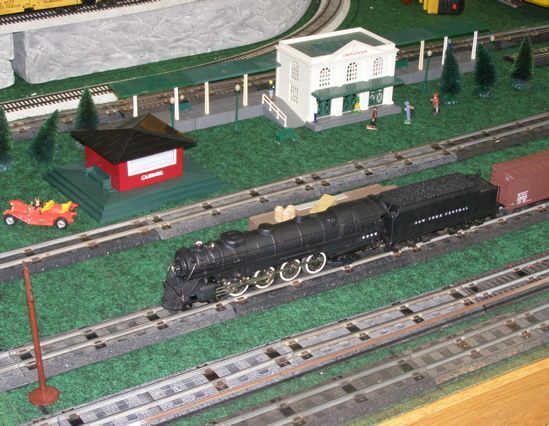 Here is the Mohawk in operation on the ACSG modular layout that was set up at the Military Aviation Museum in Virginia Beach on November 27, 2009. The big 4-8-2 is passing the Union Station on track number 3 pulling a string of freight cars. I made the NYC 4-8-2 Mohawk in December 2007. After a few years I began to wonder if I could make a long tender to go with it, modeled on the long tenders the New York Central mated to many of its Mohawks. These tenders had a capacity of 43 tons of coal. Finally, in November 2013, I assembled the various parts needed for the project and produced a long (about 10 inches) tender using the Gilbert NYC Hudson tender as a starting point. These pictures show the results of this project, with the tender behind my Mohawk. The NYC did not need to increase the water capacity because these trains usually followed the routes with between the rails water troughs. The water was replenished on the fly using scoops mounted below the tenders.